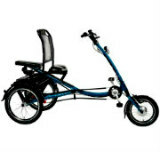 The semi-recumbent tricycle takes a page from the semi-recumbent bike design in that it uses the pedal forward concept. The net result is it makes pedaling easier and lowers the center of gravity. Many riders find that this pedal position feels more comfortable as well. Notice the pedals are well forward of the seat post hence the "pedal forward" description. Also not only does this trike have a seat back but the seat back is higher than most trikes for added support. The handlebars are swept back and raised for a natural, upright, seating position. A lower center of gravity enhances stability and assures that the rider can place both feet flat on the ground while seated. It does add a few inches to the overall length but the difference in handling is negligible. Seniors sometimes find recumbent trikes a bit too low and traditional trikes a little too hard to pedal. The semi-recumbent trike blends the best features of both to bridges the gap between them.